PARIS: Lebanese Prime Minister Saad Hariri arrived in France Saturday from Saudi Arabia, where his resignation announcement two weeks ago sparked accusations that he was being held there against his will. 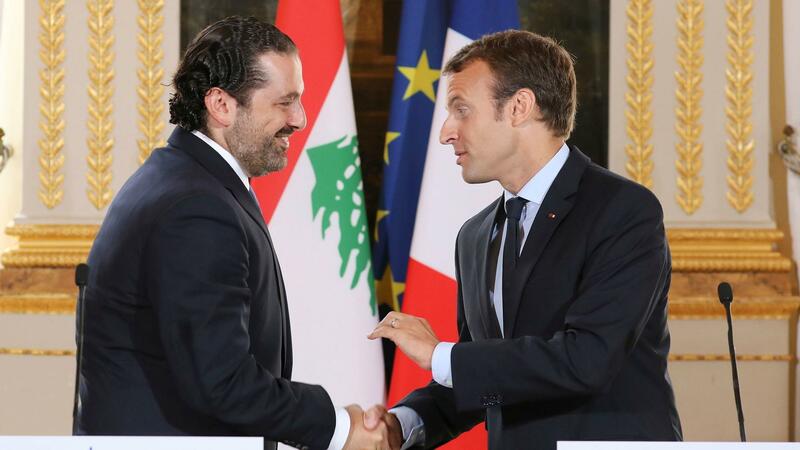 Hariri is in Paris at the invitation of France’s President Emmanuel Macron, who is attempting to help broker a solution to a political crisis that has raised fears over Lebanon’s fragile democracy. Hariri and his wife Lara, who landed at Le Bourget airport outside the French capital at 7:00 am (0600 GMT) after flying in from Riyadh overnight, were due to meet Macron at noon. The couple were whisked to their Paris residence in a seven-car convoy under tight security.“To say that I am held up in Saudi Arabia and not allowed to leave the country is a lie,” Hariri had tweeted just before his departure, adding to repeated denials of the rumours from Saudi officials. A source close to Hariri said the premier had held an “excellent, fruitful and constructive” meeting with powerful Saudi Crown Prince Mohammed Bin Salman before he left. Hariri, a dual Saudi citizen who has previously enjoyed Riyadh’s backing, made the shock resignation announcement on November 4. He said he feared for his life, accusing Iran and its powerful Lebanese ally Hezbollah of destabilising his country. But Hariri’s failure to return from Saudi Arabia prompted claims he was essentially being held hostage there, including from Lebanese President Michel Aoun who refused to accept his resignation from abroad. Hariri’s resignation was widely seen as an escalation of the battle for influence between regional arch-rivals Sunni Saudi Arabia and Shiite Iran, which back opposing sides in the conflicts in Syria and Yemen. His attempt to step down also coincides with a purge of more than 200 Saudi princes, ministers and businessmen. Hariri met French Foreign Minister Jean-Yves Le Drian in Riyadh on Thursday as Paris, which held mandate power over Lebanon for the first half of the 20th century, seeks to ease the crisis. In a related development, Riyadh on Saturday recalled its ambassador to Berlin in protest after Germany’s Foreign Minister Sigmar Gabriel made comments interpreted as a suggestion that Hariri had acted under Saudi orders. Without mentioning Saudi Arabia directly, Gabriel had on Thursday said he shared concerns about the threat of instability and bloodshed in Lebanon and warned against “adventurism”. “Lebanon has earned the right to decide on its fate by itself and not become a pinball of Syria or Saudi Arabia or other national interests,” he had said earlier in the week. Prior to Hariri’s departure, the Lebanese president — an ally of Hezbollah — welcomed the announcement of the trip to Paris, expressing hope that it was the “start of a solution”. “If Hariri speaks from France, I would consider that he speaks freely,” Aoun said in a statement. Lebanon to either formally resigns or rethink his decision. France’s intervention was the latest in a string of European efforts to defuse tensions over Lebanon, where divisions between Sunni Hariri’s bloc and Shiite Hezbollah have long been a focal point in a broader struggle between Riyadh and Tehran. Hariri — whose father, ex-prime minister Rafik Hariri, was killed in a 2005 car bombing blamed on Hezbollah — took over as head of a shaky compromise government last year, which includes the powerful Shiite movement. Hariri’s resignation comes as the long-standing rivalry between Saudi Arabia and Iran intensifies and as Riyadh undergoes a major shake-up under the ambitious crown prince.